On May 8, Iranian President Hassan Rouhani condemned President Donald Trump’s decision to withdraw from the nuclear deal. In a televised address, Rouhani said Trump “is not loyal to international commitments” and that his behavior disgraces the American people. Rouhani said he has ordered the foreign minister to negotiate with the other countries that remain in the agreement — Britain, China, France, Germany and Russia — to find a way forward despite the U.S. withdrawal. He warned that Iran could start enriching uranium “without limitations” in a matter of weeks if his country’s national interests cannot be guaranteed within the accord, known as the Joint Comprehensive Plan of Action (JCPOA). In a speech at Farhangian University, Supreme Leader Ayatollah Ali Khamenei expressed skepticism that Britain, France and Germany could guarantee Iran’s economic interests. The following are reactions by Iranian officials. “Tonight, we witnessed a very important and historic experience. Based on what was said 40 years ago, and we have been repeating this, Iran is a country that adheres to its commitments, and the U.S. is a country that has never adhered to its commitments. 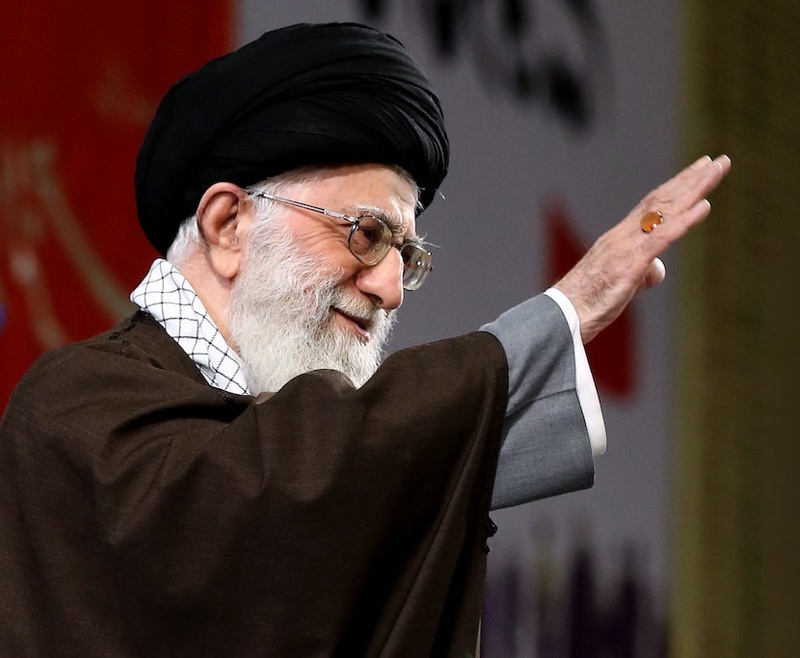 Our history in the past 40 years, even prior to that, told us and has indicated that the Americans --speaking of their approach towards the people of the region and the people of Iran – they Americans have always adopted a hostile approach. And that includes the coup against the legitimate government of Dr. [Mohammad] Mosadegh and also their interventions during the time of the previous regime, their support for Saddam [Hussein], and also their targeting of an Iranian passenger aircraft and killing of innocent people by the U.S. warship, and also the measures they have carried out against the people of Afghanistan, Iraq, Yemen, and also the people of the Middle East region and the people of North Africa, and also the measures carried out by the Americans in other parts of the world. “Tonight, the Americans announced that they have withdrawn from the JCPOA, and in fact, it was an emphasis of what they have been doing in the past months. So, since the signing of the nuclear deal till today, when has the United States ever adhered to its commitments? Just a few statements have been released. So, has there been any action to the benefit of the Iranian people? Or, have the Americans acted in accordance with the nuclear deal and its framework? “Based on what has been said by the IAEA [International Atomic Energy Organizaton], the Iranian nation has adhered to its commitments, and the Iranian government has actually fulfilled all its commitments beseeched by the JCPOA. But today we can clearly see which country is not respecting the international commitments. The JCPOA was not an agreement between Iran and the United States, so that the U.S. would be able to just exit the deal. JCPOA has been a multilateral, international agreement endorsed by the U.N. Security Council and also Resolution 2231. Therefore, the United States officially announced tonight that it pays no attention to international commitments. “Prior to [taking action on] the JCPOA, Mr. Trump voiced his position concerning the issue of climate change and pulled out of the [Paris] climate deal. And there were other agreements, such as trade agreements. He also pulled out from those trade agreements as well. So, there's precedent to this, and there's a background. “Our people witnessed just a few minutes ago the only regime that supported Trump's standpoint was the illegitimate Zionist regime [Israel], the very regime that martyred our nuclear scientists -- the very regime that is perpetrating atrocities and crimes against the people of the region, that perpetrates crimes against the innocent people of Palestine. “From this moment, the JCPOA exists between Iran and five countries. From this moment, the 5+1 [powers] has lost one of its members. And in such a condition, we should wait for the six major world countries to see what they are going to do in connection with this nuclear deal. I have ordered the foreign minister to hold negotiations with European countries in the next few weeks, and also the other two major countries, namely Russia and China, to hold consultations and to do the necessary coordination to hold necessary negotiations. “So, if at the end of this short period of time, if we come to the conclusion that with the collaboration of five countries it is feasible to attain what the Iranian people wish -- despite the views of the U.S. and the Zionist regime and also the impolite remarks by Trump-- we should see whether it is possible to just keep up with the JCPOA and also take steps in line with regional peace and tranquility. “And if we come to the conclusion that our interests are not guaranteed, I will speak with the Iranian people and also, in such a condition, I will inform the people about the decisions that are going to be adopted by the establishment. But I should emphasize at this point that our people should not be concerned about the future of the country. “Since many weeks ago, since several months ago, we have come to this conclusion that Trump is a person who is not loyal to international commitments, and he will not remain loyal to the JCPOA. And on this basis we adopted the necessary decisions with respect to economic matters. Regarding the issue of foreign exchange, we adopted certain decisions. We are facing a JCPOA without the United States, and our people will see that our economic growth will continue and that there will be calm in the market, and also that the foreign exchange needed by the country will be obtained. And regarding essential goods and commodities, the commodities needed by the people, there should be no concern. “From tonight, the Iranian people [will] become more determined and become more united, and, in fact, what Trump did was psychological warfare and economic pressure. We will not allow Trump to triumph in exerting economic pressure on the Iranian people. We will not let him triumph. History shows that our people have always been victorious in the face of conspiracies, and we will also emerge victorious at this juncture. “I have also ordered the Atomic Energy Organization to be fully prepared for subsequent measures if needed, so in the case of need, we will start up our industrial [uranium] enrichment without limitations. So, till that time to adopt that decision we will wait for a few weeks, and those who signed this deal, we will consult with them. Everything depends on our national interests. If our interests are met within the JCPOA, we will continue this trend. And if JCPOA turns into a piece of paper without guaranteeing our nation's interests, then there will be a clear path ahead of us. I assure the people of Iran that, since several months ago, the government has made the necessary plan for all the conditions, and we will have no serious problems. We will overcome this issue through unity and coordination and steadfastness, and our people will have no problem with their daily life in the upcoming weeks, months and years to come. "Under the current conditions, Europe has a very limited opportunity to preserve the nuclear deal, and must, as quickly as possible, clarify its position and specify and announce its intentions with regard to its obligations." "I don't trust these three European countries either." "If you can get guarantees, fine, although I doubt it. If not, we cannot stay in the JCPOA agreement." The unlawful withdrawal of the U.S. President from the Joint Comprehensive Plan of Action (“JCPOA”) is but the final of long and persistent violations of this accord on the part of the United States, and especially since the coming into office of its new extremist Administration. Mr. Trump’s absurd insults against the great Iranian nation indicates the extent of his ignorance and folly. Moreover, his baseless charges against the Government of the Islamic Republic of Iran in fact befits a regime which has through its interventions dragged the Middle East into chaos and ignited terrorism and extremism; whose Zionist ally is engaged in unprecedented cruelty, violations of human rights and aggression; and whose regional clients gave birth to and nurtured terrorist groups, which Mr. Trump in a ridiculous claim linked to the Islamic Republic of Iran. It is regrettable that this kind of individual now governs the civilized and peaceful American people. Ever since his election campaign, Mr. Trump has declared his hatred of the JCPOA, an accord recognized as a victory of diplomacy by the international community. Since taking office, Mr. Trump has not only made explicit and official statements against the agreement in violation of its provisions, but has in practice also failed to implement U.S. practical – and not merely formal commitments under the JCPOA. The Islamic Republic of Iran has recorded these violations in numerous letters to the Joint Commission convened under the JCPOA, outlining the current U.S. Administration’s bad faith and continuous violations of the accord. Thus Mr. Trump’s latest action is not a new development but simply means the end of the obstructionist presence of the United States as a participant in the JCPOA. The JCPOA is a multilateral accord adopted unanimously in a United Nations Security Council resolution, which in contrast with the claims of Mr. Trump, is not merely an agreement of his predecessor whose implementation can be ignored by a succeeding U.S. Administration. This action on the part of the U.S. President is not limited to the JCPOA. Indeed, violations of law and breaking of commitments have become a pattern under the current U.S. Administration, going from the Paris Climate Accord to the Trans-Pacific Partnership. It was only due to the global consensus on the JCPOA and the accord’s inner strength that it took the United States Government sixteen months to explicitly and officially pull out. Beyond further damaging the credibility of the United States on the world stage, the U.S. withdrawal from the JCPOA has put into question the foundation of international relations in today’s world, the credibility of accords entered into with the U.S. - whether bilaterally or multilaterally – and also put the present system of international law in serious danger. Unlike the U.S., the Islamic Republic of Iran is committed to its international obligations and sees the upholding of such commitments as a fundamental religious principle and an incontrovertible norm which underpins international law. So far, Iran’s fulfilment of all its commitments under the JCPOA has been verified by the only internationally recognized authority, namely the International Atomic Energy Agency, and repeatedly acknowledged by all parties to the JCPOA, including the U.S. As such, unfounded claims and ludicrous propaganda shows have no value or credibility within the JCPOA, especially since the International Atomic Energy Agency, following the accusations made by Trump and his accomplices, has again reiterated that Iran is abiding by its commitments under the accord. Iran, as a country that has remained committed to its legal obligations, will pursue the U.S. Government’s decision to withdraw from the JCPOA as provided by the mechanisms and provisions of the accord, and if the U.S. withdrawal is not fully compensated and the full interests of the Iranian people are not met and guaranteed - as stated in the accord and as outlined by Iran’s Leader on 9 May - it will exercise its legal right to take whatever reciprocal measures it deems expedient. Other parties to the JCPOA, and especially its three European signatories, must take necessary action to safeguard the accord and to implement their commitments – which they proved incapable of fully performing even while the U.S. was nominally a party to the deal, due to the obstructions by the Trump Administration – and to proceed from giving pledges to taking practical action without any preconditions. None of the provisions or timeframes within the JCPOA, which were the subject of twelve years of negotiations, are negotiable in any manner. The U.S., which has through its meddling and erroneous policies ignited extremism, terrorism, destruction, war and child killing in our region, is in no position to issue any diktat about the Islamic Republic of Iran’s lawful presence within its own region nor its effective support for the peoples of Syria and Iraq in their endeavor to fight extremists. The U.S. and its allies, which through their support for the regime of Saddam Hussein, including equipping it with chemical weapons and the most advanced military equipment while blocking Iran’s access to any means of defense victimized the Iranian people for eight years, and currently turning our region into a powder keg through their sale of hundreds of billions of dollars of useless advanced weaponry devouring the financial resources of the region, are in no position to impose restrictions on the Islamic Republic of Iran’s lawful means of defense, including defensive ballistic missiles which have been designed to carry conventional weapons based on the bitter experiences of the war with the regime of Saddam Hussein. Indeed, such efforts explicitly violate the principles of international law, and the Islamic Republic of Iran’s legitimate right to self-defense under Article 51 of the United Nations Charter. As announced by the President of the Islamic Republic of Iran on 8 May, the Foreign Minister has been tasked with the duty of taking the necessary measures to obtain required guarantees from the remaining parties to the JCPOA as well as Iran’s other economic partners, and to immediately report the results of this mission. Meanwhile, the President of the Atomic Energy Organization of Iran has been tasked with taking all necessary steps in preparation for Iran to pursue industrial-scale enrichment without any restrictions, using the results of the latest research and development of Iran’s brave nuclear scientists. The people of Iran will with calm and confidence continue their path towards progress and development and the Government of the Islamic Republic of Iran has foreseen all necessary measures to facilitate this under any circumstance. The Islamic Republic of Iran, as a secure and powerful state, which derives its security and economic development from within, relying on the prudent participation and resilience of its brave and civilized people, seeks constructive and dignified engagement with the world, and as shown by its implementation of the JCPOA despite the United States’ continuous violations, is a trustworthy and committed partner for all who are prepared to cooperate on the basis of shared interests and mutual respect. *Some lawmakers criticized the burning of the American flag. "Two thirds of the American people are against Trump's decision, according to reports. Setting fire to the flag puts the American people against us," said Vice Speaker Ali Motahari. Another member, Fatemeh Saeidi said the flag burning didn't serve Iran's interests. “The US withdrawal from the JCPOA was just an excuse. Their real goal is Iranian nation’s surrender."